Our hair is often referred to as our crowning glory! Keeping this crown of glory strong, healthy, shiny and smooth is not an easy task. Not every individual is lucky enough to have a good crop of hair with minimal efforts and a majority of us often end up going extra miles to keep our hair in top shape. During our healthy hair journey, we often come across a number of suggestions, advices, tips and tricks, etc., which claim to make our task of maintaining healthy hair successful. However, not every information that you come across is true. There are a lot of myths as well regarding hair care and you need to be aware of them so that you do not end up causing any harm to your crown of glory. Over the years, we have blindly followed them in hopes that we would make our hair healthy and strong. But by the end of this post, we hope you become self-aware of whether the advices are myths or truths. Below are some of the most popular hair care advices which have been making the rounds as truths but in reality they are just myths. We have heard this one hair care advice countless times but in reality this is just a myth! Your hair grows from the scalp so having it cut or trimmed on a regular basis does not guarantee growth of hair. The reason why you need to get a regular trim is so that your hair does not appear thinner at the ends and break off due to the frayed edges. A majority of us notice hair fall while we are in the shower but this does not mean that it is due to shampooing. The hair fall that you see is caused due to other factors such as stress. Lack of shampooing can in fact worsen your problem as it will lead to build-up of oil which in turn will cause inflammation and hinder the growth of your hair. This is one of the biggest myths regarding hair care! We have often been told that one should brush their hair ample times in a day as this will ensure healthier hair. However, this is just a myth and instead of healthier hair, you might end up shedding your hair due to all the excessive brushing. Another hair care myth which carries no weightage at all. Earlier the norm was that one should wash their hair every day which then slowly changed to every other day. But the truth is that you should wash your hair as and when you feel that your roots have become oily and greasy. This is the only hard and fast rule that needs to be followed while thinking when to wash your hair. Though it is true that blow drying your hair can cause some harm to it, using a low temperature setting on the blow dryer to dry the hair is actually much better than just depending upon the natural air. This is because blow drying may cause just external harm; however, natural drying can cause deeper harm to your hair. When left for long, the water molecules will penetrate the structure of our hair and in the process, you would lose out on all the keratin, making your hair dry and brittle. Though it might not appear so, but there are a lot of facts and truths about our hair that we remain unware of. Here are some fun and surprising facts about your hair which you might or might have not known about. 1.Hair grows quicker in warm climates. Yes, this is true! During warmer climates, the heat helps in stimulating circulation which in turn stimulates growth of hair. This is why you would observe that your hair grows a little quicker during summers rather than winters. 2.Hair colours are extremely important and we often end up getting the colour of our hair changed as per our needs and preferences. But did you know that black is the most common hair colour in the world while the most rare natural hair colour is red. Natural red hair can be found in only 1% of the world’s population while blonde is the second most rare hair colour (2% of the population). 3.A single strand of your hair can support a weight of 100 grams. On an average, each individual has anywhere between 100,000 to 150,000 hair strands on their head. This means that your head of hair can approximately support the weight which is equal to that of two elephants! 4.Are you one of those people who are always looking at growing their hair? Well, it can take you almost 7 years for your hair to grow up to your waist and if your aim is just till your shoulders then the time span is somewhere around 3 years. 5.Your hair is made up of various components such as carbon (50%), oxygen (21%), nitrogen (17%), hydrogen (6%) and sulphur (5%). So there you have it! 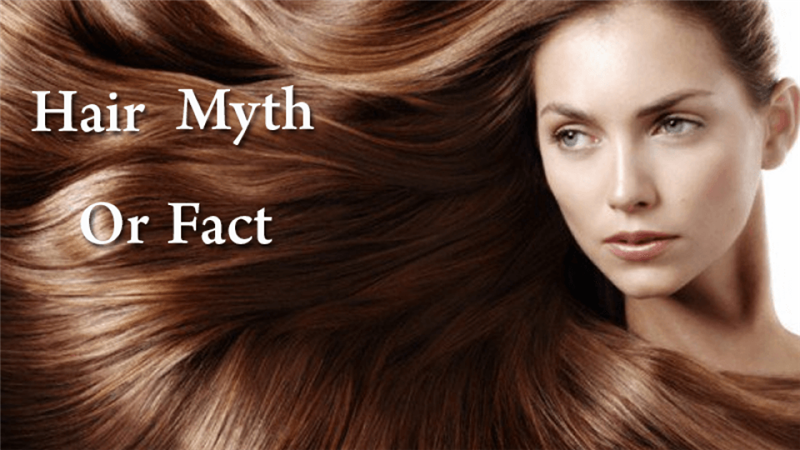 Some interesting and surprising myths and truths about your hair care. There is no doubt that you need to pay extra attention to keep your hair healthy and strong. However, this should not come at a price of ignorance. Now that we have busted some of those hair myths for you, keep them in mind the next time someone advises you to follow any of those suggestions.